We know how tough it can be to find the right pair of shoes for the job which is why we have comprised this list of the very best shoes for nurses, to help take the guesswork out of choosing the perfect pair of shoes. The items on this list have been chosen after careful research and review in order to bring you the most relevant, highly rated, and up-to-date information to help you in making your decision. We hope to offer a pair that is suitable for any and all Nurses. Keeping yourself comfortable and supported ensures you can give the best care possible to those who need it without being distracted by pain. The latest update to this article replaces two items and expands the Criteria for Evaluation section with more relevant information you will need in order to purchase the best possible pair of footwear for your job as a nurse. We've updated our list to narrow down the top ten shoes for nurses and doctors, based on performance, reviews, comfort, and functionality on the job. We've added three new models to help keep you going long during shifts, and added a 'Terminology' section to highlight terms used in the review. We have recently updated this page to include the most relevant and up-to-date information. We have revised our product details and re-worded some aspects to provide a clearer and more informative page. Additionally, we have included a 'Terminology' section that highlights and defines important terms used throughout the page. The Crocs Classic is a clog made from synthetic material that promotes comfort and provides a supportive wear. The Classic features a low ¾-inch platform and fully molded Crocs Croslite midsole for signature Crocs comfort. These perforated clogs are lightweight, long-wearing, and ultra-comfortable, while their non-marking outsole is hospital-flooring friendly. Crocs were an instant hit for a reason and once you try them you too will know why. This clog was designed specifically for its support factors and will not be a letdown. With a spacious toe box, it is ideal for both wide and narrow feet. Your toes will be able to naturally splay which will help you continue to feel great as the hours wear on. The unique material was specially designed to form with your foot because the material softens with body heat. Hence the reason so many people will tell you their Crocs feel like they were made just for them. The Classic features Crocs Croslite materials for signature Crocs comfort and are designed with a low ¾-inch heel and back strap for a more secure fit. The Classic is lightweight and long-lasting while its non-marking outsole is perfect for hospital and care-home working environments. You can purchase this professional clog online for a low price and it is one to seriously consider for its long-lasting and comfortable properties. Crocs keep it affordable for everyone and offer a shoe that is necessary for pretty much all walks of life. One of the main setbacks of a nursing job definitely has to be the fact that you’re expected to stay on your feet for long hours, often in shifts that last for 12 hours or more, while still having to maintain maximum concentration on the task at hand. The Birkenstock Super Grip is the perfect choice for this profession seeing that it combines several important factors that are required throughout a regular working day at a hospital. This clog was specially developed for the workplace, and is offered in two color options, black and white for a clean, professional look. The full grain leather upper can be adjusted through a strap at the instep, it’s easy to clean, and will mold to your feet with wear, giving you a pair of footwear that’ll last years with just a bit of care. The footbed offers plentiful arch support, a stabilizing heel cup, and a raised toe bar that makes walking easier by allowing your toes to grip more efficiently. The recognizable roomy fit of Birkenstocks is another great feature, as you won’t have to worry about fit issues if your feet start to swell after a hard day (or hours standing in surgery), and the EVA foam midsole provides just the right amount of cushioning to make you feel comfy all day. A special rubber outsole ensures a great grip, even on wet surfaces, so you won’t have to worry about watching your step, even in emergencies. 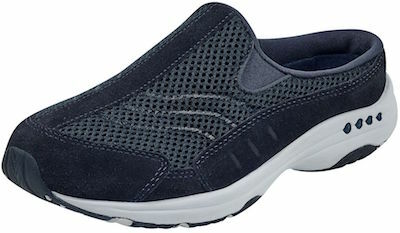 Skechers for Work is a line of the brand’s footwear made for individuals on their feet all day. The Flex Advantage is slip resistant but also slip on, great for hospital halls and hectic afternoons. Its lightweight mesh and fabric construction keeps your feet cool in stressful situations, and boasts of Skechers comfort to keep you going all day long. Developed specifically with nurses, doctors, and other individuals whose work requires long hours on their feet, Skechers developed their ‘Skechers for Work’ line of footwear. The McAllen is made to be lightweight and flexible, keeping foot fatigue down, and breathability maximized. Slip-resistant traction of the outsole keeps you upright, even if things spill on the job. Slip on styling of the shoe makes them quick to get on, easy to get off, so you don’t’ need to hassle with laces. Elastic side gores help to give some adjustability to fit while keeping your foot snuggly in place. Memory foam insole gives ample cushioning for all day wear and tear, and a padded collar helps cut down on blistering. 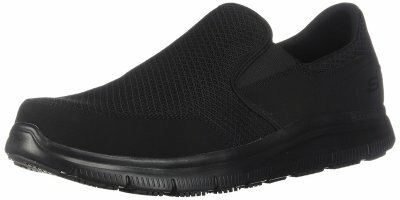 The Skechers McAllen brings memory foam comfort and slip resistance to a very budget friendly option of footwear for hard working nurses. Slip on style makes them easy for wearing, and their design was made for long hours of standing or walking. A great option to consider trying out for your next new pair! Brooks is one of the top brands for running and walking sneakers, but the Addiction Walker keeps all the required technical features of a sneaker needed for those on their feet all day. Slip-resistant outsole, strong support, and superior cushioning will keep you going long into the night when duty calls. Thick cushioned soles help support each step you take, and comfort is found throughout the make of the sneaker. When it comes to sneakers, most times technology helps with runners, to keep them going long, but the Addiction Walker takes into consideration individuals who walk or stand throughout the day. The midsole is comprised of MoGo cushioning, which helps return energy to you with each step, and retains its durability through the lifetime of the sneaker. Padded tongue and collar help prevent blisters or irritations during extended wear, so you can keep going for longer shifts. A thick plush sole supports the base of the Addiction Walker, absorbing impact and helping to reduce fatigue. It’s non-slip resistant as well, so you won’t need to worry when hurrying to the next emergency. Supple full grain leather comprises the uppers, allowing you to feel supported while maintain the sneakers integrity. Similar to others on our list, the Brooks Addiction Walker is averagely priced, similar to a quality running sneaker in price. Made for individuals who walk or stand long hours, it’s packed full of cushioned support, and has a non-slip sole. With several selections of widths and sizes, and some good color options, it’s a solid option to consider! The Dansko Professional Clog is made of leather and features a Polyurethane outsole. Designed with a low 2-inch heel and ¾-inch platform, the Professional is a great choice of footwear for anyone working as a nurse. This comfort-first clog boasts a wide reinforced toe that provides added protection, along with a padded instep collar for additional support. The Professionals wide heel strike makes for a stable ride while its memory foam footbed has you walking in comfort. Designed with an innovative rocker bottom which propels the foot forward and provides excellent shock absorption, this stylish clog is an ideal shoe for anyone standing on their feet for hours at a time. This iconic clog has a closed back and superior arch support that will make this brand of shoe your favorite. Keeping your feet supported will help you maintain comfort throughout your body for the whole day. Finding a pair of shoes that will support your heels, arches, and soles can be difficult but not when you give the Dansko Professional Clog a try. With a heel measuring two inches, you can count on a natural and comfortable balance. The padded collar supports your ankles for those long hours and it features a rocker-bottom so you can walk with ease. As we know keeping up day after day is hard enough, adding sore feet just makes it even harder. This clog can be found online for an impressive price and you can't beat the undeniable comfort and support it offers. This shoe was designed to be worn for high-risk duties and atmospheres. They will last through tough use and they won't break the bank. What more could we ask for? 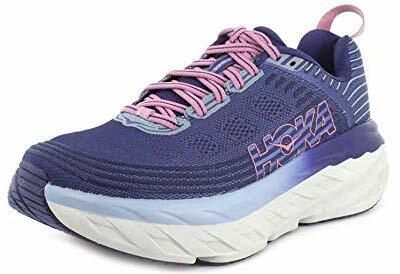 Hoka One One sneakers are often the choice of avid runners who are looking for that ideal amount of cushioning at affordable prices. The Bondi 6 is the latest edition of their maximalist shoe that keeps your feet protected from shock, and although you won’t be expected to run (at least not too much) at your work, your body will definitely appreciate the cushioning. The upper is made from open, engineered mesh that will allow your feet to breathe, keeping you cool at all times. The midsole is made with compression molded EVA foam which is 30% softer than similar foam materials, ensuring that your body is fully protected from any type of shock. This can help prevent knee and back problems, making your time at work less uncomfortable. The entire shoe is shaped so that it has a rocker bottom which ensures smooth transitions from heel to toe, propelling you forward with each step. The rubber outsole is thin and lightweight, but has been designed in a way that allows the entire bottom surface of the shoe to touch the ground, giving you a good amount of traction, even in less than ideal circumstances. You’ll find that the Bondi 6 is one of the more expensive items on this list, but compared to maximalist shoes by leading athletic companies, it actually comes at an average price. Another great thing about this shoe is the fact that it’s available both in medium and wide widths. The Easy Spirit Traveltime hits the top of our list for overall comfort, ease of wear, cushioning and lightweight design. Leather and textile create the breathable uppers, making them both durable and light. Rubber soles give grip and texture to the tread for those who move at a quick pace. Easy to slip on when on the go, and off after a long day in the office, their superior shock absorbance and comfort won’t leave you sore. A thick rubber sole creates ample cushioning for walking throughout the day, patient to patient. Along with cushion, it allows great traction in hospital hallways, but may not be ideal for ER related work as it is a slip-on style of shoe. However, slip-ons can be great for checking on patient rooms, running to and from labs, or computer work. A removable sock liner lets you customize your comfort level for all-day wear. Removable sock liner also helps provide some shock absorption throughout the day but can be replaced with custom orthotics if preferred. Rounded toe lets your toes splay naturally without restriction, especially important for those on their feet all day long. The Traveltime is made for all-day walking and wear, and will not disappoint for nurses! One of the budget-friendly options on our list, the Easy Spirit Traveltime mule is not just great for jet-setting, but for hard-working individuals on their feet all day long as well. It’s thick cushioned sole, removable sockliner, and slip-on style will leave you supported, comforted, and feeling great at the end of a long shift! This stylish shoe is unbeatable in the nursing field because it delivers top comfort and stability. It is slip-resistant a features an adorable button strap. Alegria is known for their top-quality shoes. They are trusted by working feet because they provide great support and shock absorption. Their unique style is a welcome sight in this type of shoe. Overall the Paloma Flat is versatile and well wearing which will go great with any nurse's wardrobe. With a full leather upper and durable rubber outsole it will meet expectations of a long-lasting professional shoe. The rocker-bottom drives you forward allowing natural movement. In addition, they have a wide toe box that will allow your toes to move freely. This helps your feet feel better at the end of the day. The Paloma Flat has cork footbed with the abilities to form to the foot for a comfortable fit and it can also be removed if you choose to do so. Cork is excellent at absorbing and reducing the shock that the wearer feels. The rocker bottom not only provides support but also increases the overall comfort of the shoe. This clog is quite unique and at a very affordable cost. If you want to style your scrubs with something quite eye catching the Paloma flat is an excellent choice. Make your mark with bold designs and keep yourself supported and comfortable. Merrell's Jungle Moc Pro is a work inspired slip-on which features a waterproof full grain leather upper and a slip-resistant rubber outsole. A low one-inch heel and Dri-lex Shubuck lining will have you walking in deluxe comfort, while M-Select FRESH antimicrobials prevent odors from occurring. Complete with Merrell's innovative air cushion in the heel to better absorb shock, along with a molded nylon arch shank for additional stability. The Jungle Moc Pro offers a stable and well-supported ride thanks to a low one-inch heel height and molded nylon arch shank which help the wearer to feel secure and more sure of foot. The rubber outsole also keeps you securely on your feet. Long hours and slick floors will be no problem when you try this option by Merrell. Breathable and waterproof full-grain leather combined with a slip-resistant rubber outsole make the Moc Pro a strong contender for anyone working in the healthcare profession. Its innovative air cushion technology in the heel, along with M-Select FRESH antimicrobials ensure a fresh and comforted wearing experience. The Moc Pro is an affordable and high-quality pair of shoes that are an ideal consideration for anyone working in the healthcare industry who will be standing for an extended period of time each day. Falling towards the middle of our price range most budgets will be able to afford them. They will last you a long time and keep you feeling better than ever before. 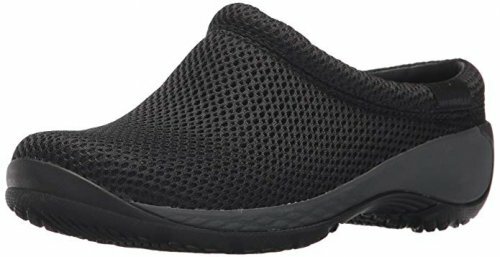 Merrell Encore is a comfortable slip-on shoe made from full-grain leather. It features an M-Select GRIP outsole and a low 2-inch heel for an easy wear while working. The Encore Guest is designed with Merrell air cushion in the heel that absorbs shock, along with a compression molded EVA frame for added stability and cushion. Your feet will be completely pain-free thanks to the Ortholite footbed and breathable mesh lining that wicks moisture away from the foot. A sticky-rubber outsole offers a flexible wear and minimizes foot and leg fatigue so you won’t have tired or achy feet at the end of the day. The Encore features Merrell’s innovative air cushion in the heel that absorbs shock and cushions every step. Its compression-molded EVA frame adds stability, while an Ortholite footbed makes for an enjoyable wear. The Encore is made with a breathable mesh lining that wicks moisture away from the foot keeping it cool and dry while also preventing odors from occurring. In addition to helping you battle odor, they will also help you avoid painful, raw, red areas and blisters. Merrells’ Encore is a reasonably priced pair of shoes that are a great choice for anyone working in the healthcare profession. They provide the kind of shock absorption and stability needed to withstand hours spent standing on your feet. They are also quite durable so you know they will last through daily wear and long hours. Of course, we wouldn’t overlook the many different styles of shoe nurses typically find to perform well on the job. Each is very different in their own respect and offer different features that make them unique and perform well, but it’s worth noting that personal preference will be a big part of choosing the specific type best for you. That’s why we’ve included all; to give everyone an option, whether you’re looking for men’s nursing shoes, nursing shoes for women, medical clogs, cushioned athletic shoes, slip on shoes, loafers, or mules, each holds a place in the preferences for professional medical personnel. Because athletic shoes are made for constant activity, and typically have cushioning and shock absorption features, along with ample support, some specific models do really well for nurses. A big advantage of sneakers over slip-on types of footwear is their ability to be tightened for a better, “less loose” fit, which is perfect for those scrubs, nurses and medical personnel who find themselves rushing back and forth constantly, where an easy slip-on would become an easy slip off. Although can be considered a mule, or a slipper, clogs are specific in their own right. Their true definition is a wooden shoe with a heel and sole that is generally lower than similar footwear types, although modern or professional clogs aren’t made of wood. They provide adequate protection, great support, are extremely easy to wipe down or clean, and are super comfortable. Dansko is a favorite brand among clogs. They are starting to incorporate straps for a better fit and hold. Clogs are usually worn and made for women, but you can also find some great options for men. On the other hand, you have mules, which are very similar to clogs but have some significant differences. They are generally more classy in their looks, have a more pronounced heel, and less of a sole platform. You will typically see mules with straps, or buckles, but just like clogs, can be considered slippers and are also open the back. They are also comfortable and allow for easy cleaning. Just like clogs, mules are also made for and usually only worn by women nurses. A slip-on can include a number of footwear types, and in the world of medical shoes, it usually refers to clogs or mules mentioned above, and the loafers below. Not every slip-on is ideal, and this style is good for certain occasions. If you have issues with fitting or a smaller foot, you may want to go with an athletic shoe to ensure your foot does not slip from the footwear unexpectedly. Loafers are less used by nurses but can be in some cases as they have a generally professional look, but the typical loafer is not durable or extremely fitting. Although, some are. Because loafer is a general term, and refers to a shoe that does not utilize laces, but rather has a slip-on design, there are some great medical shoes that fall into the category. It’s worth noting, another specification for loafers is a generally low or non-existent heel and are made for both men and women. Not every loafer is ideal. All day comfort; you read it right! It’s been said, more than 30 percent of nurses in the United States suffer from either back or foot pain, due to their demanding, all day work, moving around on their feet. The fact is, inadequate shoes are a big part of this problem. This means the proper shoe will promote proper posture which enables correct spinal alignment, have adequate arch support (which we will cover individually) and provide a cushioned sole that offers shock absorption. What most nurses don’t know is that the lack of comfort has a massive psychological impact on the execution of their tasks. To put it in simple words, you just can’t focus properly if your shoes don’t support your feet and keep them feeling great. It’s as easy as that. Shoes are not something you should be “dealing with” while on your shift – they’re supposed to enhance your performance. It’s important to note that the comfort delivered by a shoe doesn’t only involve their usage during the shift, but after it as well. The main features that determine the comfortability of a shoe, such as its breathability, padding, soft materials, and absorption, will have an important effect on your feet after you’ve done wearing them. If a certain pair of shoes starts to create a condition that affects your ability to move normally or achieve your tasks, it will only get worse from there. It’s time to ditch them. We recommend giving priority to this factor when searching for nursing shoes. You don’t want to replace any other important factor, you just want to make sure it features an acceptable level of comfort. Cushioning is a massively-contributing factor to many of the other features present in the best nursing shoes. For instance, it plays a key role in comfort. Don’t get it wrong, though, cushioning is a critical aspect of actual performance and task execution. Remove the cushioning and you’ll find your feet feeling every foot strike and the inner workings of the shoes you are wearing. Cushioning plays a contributing role in shock absorption as well. Although it’s not the element responsible for absorbing the most shock, it helps soften each impact. Cushioning is something you normally find around the whole inner shoe; the wall padding, the tongue padding, the collar padding, and the insole, to name a few, all work as cushioning agents. The more material that stands between your feet and the floor at the moment of impact, the less shock that will get to your body. Keep in mind that, no matter how cushioned, there is no pair of shoes to this date that is able to completely nullify shock upon impact. There will always be a residual amount of energy that will go up your foot, even when walking. Lining: This is the element that covers the internal face of a shoe. It also places an additional layer of comfortable material between your foot and the sole. The quality of a lining is directly related to its softness and the comfort it delivers when in contact with feet, which at the same time is determined by the material it’s made of. What most users don’t know, though, is that the lining also plays a role in the durability of a shoe. It acts as a supporting agent that holds the inner build together with the external build, contributing to the shape a shoe has and the amount of time it lasts in its natural position. Soft materials are preferable for the lining. Padding: Padding and cushioning can be understood as the same thing. However, we’ll refer to padding as the cushioning of a specific element rather than the cushioning of the shoe as a whole. For instance, the padding of the tongue, collar, and ankle, makes a considerable contribution to the level of cushioning present in a shoe. The padding of each individual element also contributes to the support that the shoe offers. Aside from increasing comfort and cushioning, the tongue, ankle, and collar optimize the fit around each of their respective areas. Insole: The insole achieves a variety of purposes that we will explain thoroughly as an independent factor later in the guide. One of its many purposes is acting as a cushioning agent that relieves key areas of feet that are normally affected the most. A nursing shift can be really hard on the heels, for example. Depending on how you feel with your shoes, you may opt for an insole that delivers greater heel cushioning, or rather more arch support. Ethyl vinyl acetate (EVA) is arguably the most popular and widely used insole material. In a job that comprises standing and walking for the most part of the shift, features like stability and support become very important. Before going any further, it’s important to note that the stability of a shoe goes hand-in-hand with the support it offers. The support is basically what adapts your foot to the shape of the shoe. The purpose of this feature is to keep feet and shoes together as if they were just one element. As support increases, you’ll be able to have greater control and accuracy over your motions and coordinate your feet with the shoes. Think of support as the “force” that the shoe uses to compress against the foot to hold it to the shoe. As you can probably guess, support is something you don’t want to overdo either. As a nurse, you should be looking for a supportive shoe that allows you to move your feet in synchronization with the shoes. Some people think this is a default feature of all shoes, but in reality, the support varies according to the quality of the shoe. The best nursing shoes, for example, count with a decent degree of support. You can tell a shoe is supportive when you feel it somewhat pressed against your foot, and it follows your foot around perfectly. A non-supportive shoe, on the other hand, will make certain motions on its own that are not executed by your foot. The lack of support breaks the “synchronization” between a foot and a shoe. Most footwear users are unfamiliar with one of the main purposes of shoe support, which is preventing unnatural stances and movements. The support holds the shoe and the foot together to enhance each motion as if they were one, but more importantly, it holds the foot in place to prevent it from overpronating or supinating (under-pronating). For those of you unfamiliar with the term, pronation is the inward motion executed by the foot as it rolls. This movement is an instinctive reflex that helps distribute the impact force of each gait, whether running or walking, in a much more optimal manner. Contrary to what most footwear users think, the foot is not meant to stay in a vertical position at all times. Normally, the human foot pronates between 12 to 17 percent before reaching the surface it will impact. This way, it can support your body weight in a natural manner that reduces stress on the joints. This process is crucial for proper shock absorption and the distribution of impact energy. However, there’s a lot of variation in the degree to which the foot of each individual pronates when running and walking. Although the pronation process is completely natural, certain factors like the height and length of the foot’s arch can affect its ability to roll. This is where under-pronation and overpronation happen. Arch support: The arch support is often the most ignored feature in a shoe. Most footwear users aren’t able to determine the degree of arch support they need for the specific shape of their feet. This often leads to acquiring shoes with the wrong level of support or no support on the arch at all. This is in part because the lack of arch support is something that is not clearly noticeable until it starts hurting your foot. Generally, people that suffer from flat feet tend to overpronate, which means they twist their foot inwards more than they should. This not only causes an unnatural stance and weight distribution when walking or running, but it also adds further tension to the ankle and other rotating joints. Overpronators should be looking for more support than usual to control their pronation. On the other hand, people with particularly high arches tend to supinate (under-pronate). In this case, users should opt for a shoe that is cushioned neutrally in order to encourage natural feet movement. In both cases, it’s highly recommended that you seek for a customized insole. Arch support is generally generic in all shoes; it’s impossible to design a shoe that fits all arches equally. You can, however, use a personalized insert that will make the shoe fit your very own anatomy. Heel support: This feature is what keeps your heel tightly held against the back of the shoe, ensuring there’s no vertical sliding within the shoe (given that the sizing is optimal). Although often underestimated, the heel support plays a pretty important role in support. The heel acts as a pivoting agent at any point in which the foot starts pronating or twisting. It’s the very base of each pronating motion, and thus it should remain stable and support for the foot to pronate naturally and comfortably. Tongue and closure: There’s a lot of people who don’t know that the tongue actually plays a role in the supportive process of a shoe. Aside from acting as cushioning, the tongue is also meant to support the upper foot. Furthermore, the closure system will reinforce the support on the upper foot. Regardless of the closure style, it’s important that the tension of the laces, straps, or whatever you’re using is distributed evenly. The best form of support is achieved when the closure places an even amount of pressure on all parts of the tongue at the same time. The thing about hospitals and clinics is that they are to be kept pristinely clean at all times. Not only does this mean that you’ll find the floors being cleaned every couple of hours, but also that they’re often made with materials that allow the easiest possible clean-up. Often, these surfaces can become slippery (especially when wet), which makes moving around, particularly when you’re in a hurry, quite difficult. That’s why nursing and medical staff always look for footwear that’s not only comfortable, but that also offers a good amount of traction so that they are kept safe during their time at work. While some opt for sneakers, others will choose to wear clogs or work models that all ensure a secure walking experience. The key thing you should consider about the outsole of your next work shoes is that it’s made with the right materials. Rubber is usually a good option, but it’s not a bad idea to invest in a model that was made with slip-resistant rubber compound. Some manufacturers will even make their footwear oil, fat or grease resistant, which will give you a greater amount of slip protection. Some hospitals may even require you to wear footwear that’s been tested for slip resistance, in which case you should invest in footwear that’s been certified to meet this criterion. While nurses have one of the toughest jobs around, standing and walking all day, it's still important to take a break every now and again to help keep you performing your best. Take 10-15 minutes to change scenery and step outside to recharge your energy and clear you mind. Nurses can encounter a variety of scenarios during the work day, from routine patient visits, to emergency room scrambles. Consider what kinds of scenarios you're involved in most days to help select your footwear. ER nurses require something with a slip resistant sole as well as cushion and support! q: What shoes do nurses wear? We’ve answered this throughout the article, but it’s still asked enough so we want to provide a summarized answer. Nurses wear either clogs or athletic shoes, mainly. Clogs because they provide ample support and an upper that is typically liquid resistant for protecting against hazardous liquids. Athletic shoes because they are extremely comfortable, especially those from Skechers which will usually incorporate memory foam in their footbeds. q: What are the best nursing shoes for flat feet? The best nursing shoes for flat feet are the ones that offer a lower arch, more cushioning, and are stable. This is something that can be achieved to a degree by orthotics or inserts, but clogs are generally very stable, although don’t usually have the extreme cushioning an athletic shoe may have. This is where custom inserts can be used, for the purpose of compensating for clogs typical, dense midsole. q: What are the best white nursing shoes? Dansko is a highly reputable brand that makes clogs which are ideal for nursing, and quite a few come in all white. 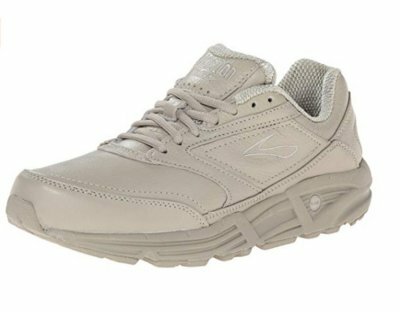 If you prefer an athletic shoe, Skechers makes some extremely commended shoes for nurses that also come in all white. We highly recommend either brand. q: What are the best nursing shoes for plantar fasciitis? You’re going to want to look for a highly cushioned shoe, as plantar fasciitis is known to be an overuse injury. This means, an athletic shoe may be your best bet, in which Skechers makes some great shoes for nurses in this category that are highly rated. q: Black or White; Which color is best? There is no absolute answer so we’ll give you some food for thought. First, consider what color is required for where you work, or if you are attending nursing school, which color is required there. Professional establishments and school environments a such usually require uniforms, in which one or the other color will be required. If that’s the case, that’s an easy answer for you. Most hospitals will not have a color requirement. Although, you should also be aware of the fact that black shoes will not show dirt or stains as easily, which is one reason they are preferred in a nursing environment where such cases where stains are unavoidable. Solid black and solid white both come off as very professional. In the case of white shoes, some have reported that as a preference as they can see any mess more easily in order to clean them.